I get great satisfaction from selecting and working wood. To me it is one of our most beautiful and versatile resources, and I love all of its varieties, shapes and sizes. I trained in furniture and cabinetmaking with Jonathan Markovitz Furniture near Wantage in Oxfordshire, where I learnt what it takes to reach excellence in craftsmanship. The importance of precision and planning in the making were core in this, whilst learning to understand and work wood itself. Simultaneously I developed my ability to challenge and refine designs, to push myself creatively whilst understanding and working within practical limitations. I’ve been a design professional for the large majority of my working career, but not always in the field of furniture and woodworking. For 15 years I worked in graphic design, in particular illustration and user-experience design for the web, culminating in the role of European Design Manager for Amazon.com. 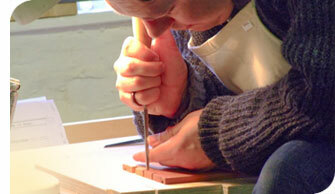 I then undertook a career change to follow my interest in wood, and working creatively with my hands. I believe strongly in the use of only sustainable woods, and constructing furniture to stand the test of time – I hope as heirloom pieces. Please feel free to take a look through my site – I update my Gallery with projects as and when I complete them. I describe my style as organic, with a touch of nostalgia. I aspire to lithe characteristics of motion, timeless qualities, and I’m not afraid to challenge visual conventions in my pursuit of such. The bold geometric shapes typical of Art-Deco furniture are a particular influence of my work. Likewise the confident, elegant simplicity of early 20th century Scandinavian makers. As my client I offer you a personal service, starting with a visit to your home or premises, and a firm understanding of what you hope to achieve. I work closely with you to explore design options including the styling, choice of timbers and finish, culminating in a presentation of two finalised designs for you to choose from. Once you have chosen, I provide you with an estimated completion date and proceed with the making in-line with this. I keep you abreast of progress along the way, until the day arrives when I can deliver and if necessary install your completed piece. I put a lot of value in the customer/designer relationship we have, and open communication, as a key part of reaching your goal.